Every baby out there is a self-proclaimed pooping pro. Although you are always on guard to change those freshly-loaded, unicorn-poopy diapers, the chances are that you may not be able to clean your baby’s bottom thoroughly every time. This often leads to a very common problem – diaper rash. Diaper rash is a skin condition characterized by red, slightly swollen and irritated skin that occurs when the genital area stays wet and in contact with urine or stool for too long. It can also be due to your baby having very sensitive skin or a diaper that is too tight and rubbing against the skin. Several other factors can also contribute to diaper rashes, such as a yeast infection, antibiotics taken by the baby or the nursing mother, a change in the baby’s or mother’s diet, and the use of scented products. Now, this does not mean that you are not a good caregiver. It just means that you are human! A number of medicated creams are available in the market, such as Desitin and diaperene. 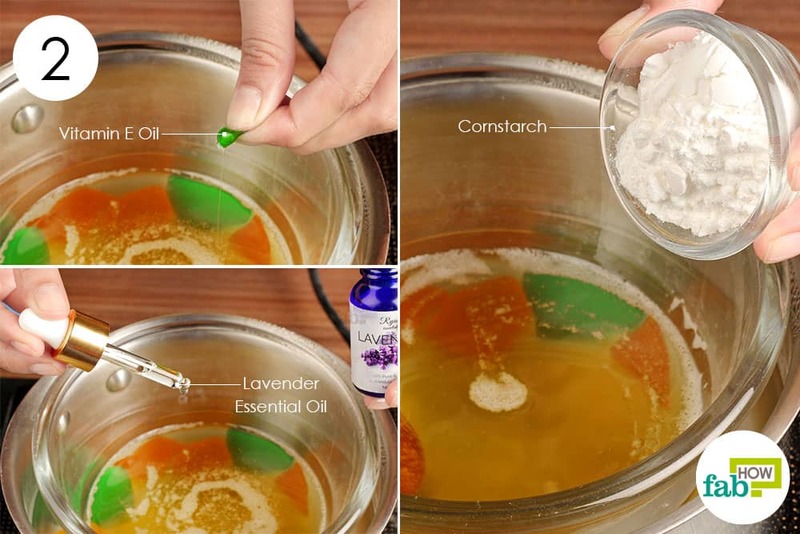 However, if you don’t want to paint your baby’s delicate bum white with synthetic stuff, an alternative option is whipping up your own DIY diaper rash cream using natural and skin-friendly ingredients. You can also treat your baby's diaper rash using any one of these home remedies. 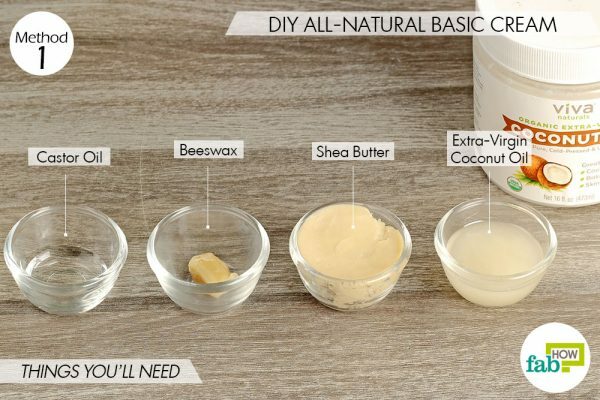 These all-natural creams are not just friendly for your child’s skin but also for your budget. They stay good for up to 3 to 4 months. Excited much? For parents, it’s like a breakthrough in diaper rash treatment! Listen up all fellow diaper changers – dread the poop no more! Here are three recipes to make your own DIY homemade diaper rash cream that can get rid of diaper rash fast. 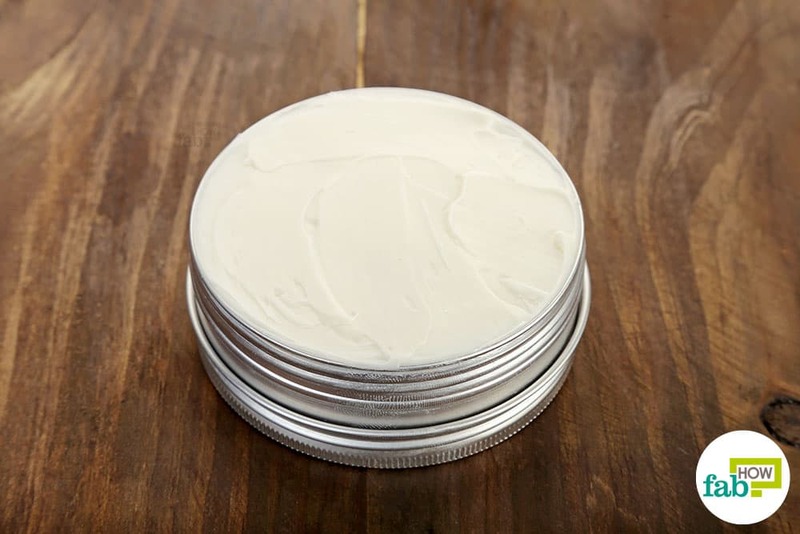 This very basic and all-natural diaper rash cream uses a blend of oils that are not only safe to use on your child’s irritated skin but also are very nourishing and soothing. Assemble a double boiler over the stove or hot plate. 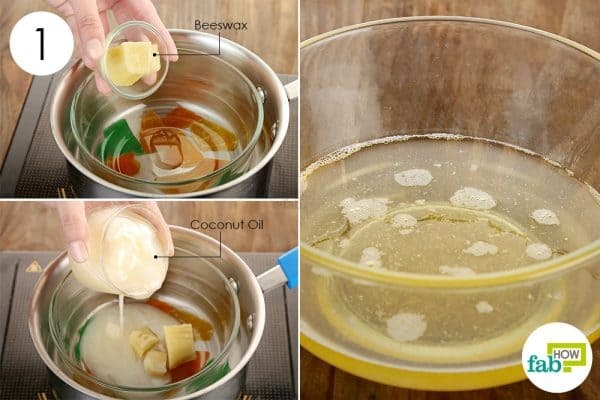 Put 1 tablespoon of extra-virgin coconut oil in the heat-safe bowl. Add 1 teaspoon of beeswax. Let all the ingredients melt and blend together, then remove the pan from the heat. 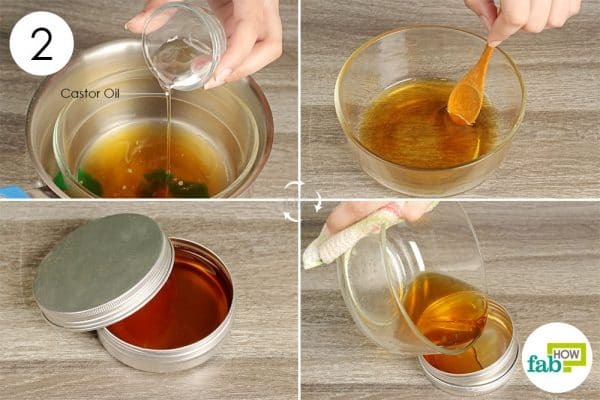 Add 1 teaspoon of castor oil to the oil blend and stir it well. Transfer the mixture to a container and allow it cool to solidify. When changing your baby’s diaper, rinse and clean the skin and allow it to air-dry. Apply this DIY homemade diaper rash cream on the affected skin before putting on a fresh diaper. 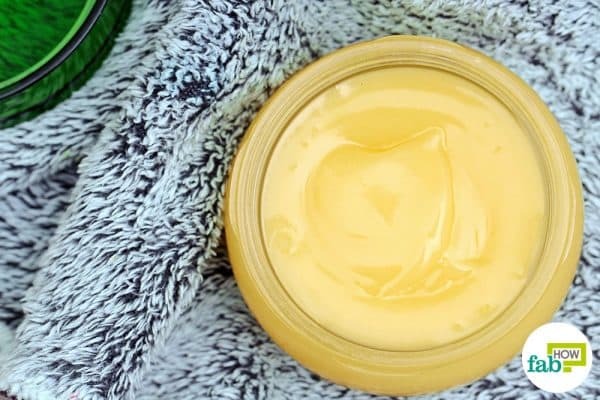 This DIY homemade diaper rash cream recipe uses cornstarch, vitamin E oil, and lavender essential oil, in addition to beeswax, shea butter and coconut oil. The cornstarch acts as a natural talcum powder that absorbs moisture and also prevents irritation due to friction from the diaper rubbing against the skin. The vitamin E oil deeply nourishes the skin, while the anti-inflammatory lavender oil soothes the irritated skin. 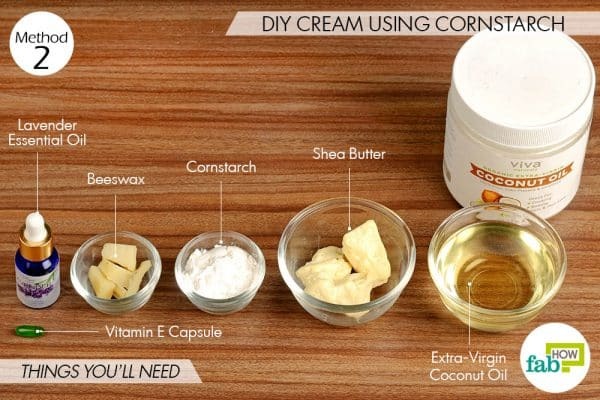 Caution: Do not use this cream if the rash is due to a yeast infection, as the corn starch will worsen the rash. Place a double boiler over a stove or hot plate on medium-low heat. 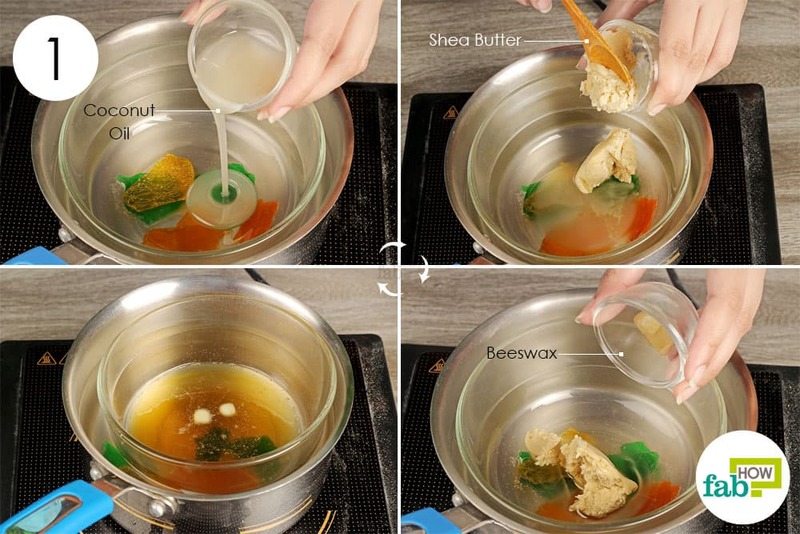 Put 1 tablespoon of beeswax in the double boiler. Add ¼ cup each of shea butter and extra-virgin coconut oil. Once the ingredients have melted, turn off the heat. Puncture 1 vitamin E capsule and squeeze the contents into the mixture. 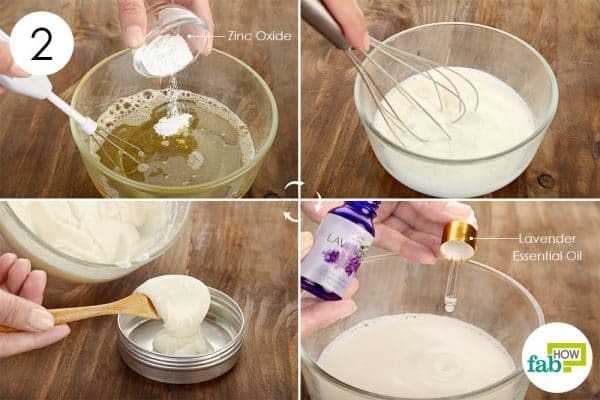 Mix the ingredients thoroughly to get rid of any lumps. 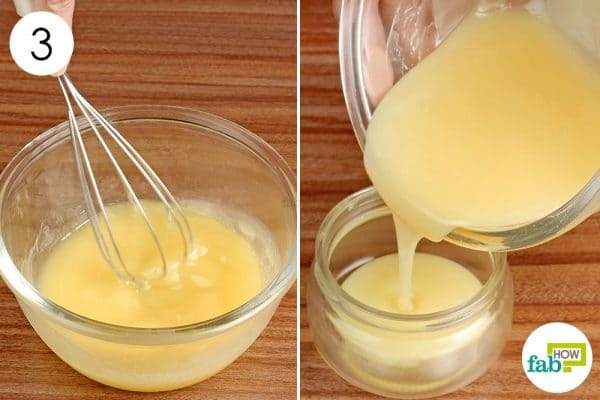 Once the cream begins to solidify but is still liquid enough to pour, give it a quick whisk. Transfer the cream to an airtight container and use it as you would any other diaper rash cream. The mineral also has soothing properties that can heal irritated skin quickly. 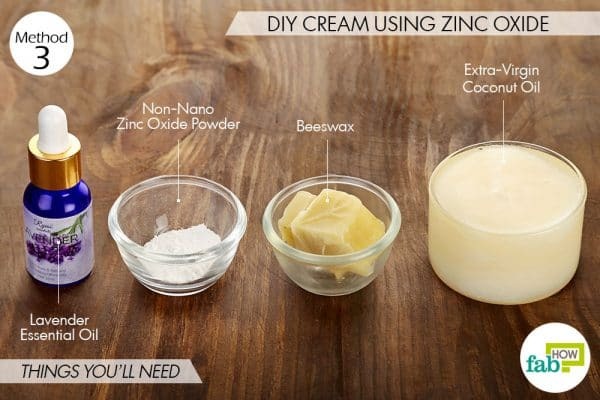 Consequently, zinc oxide can also be used to make your own sunscreen at home. 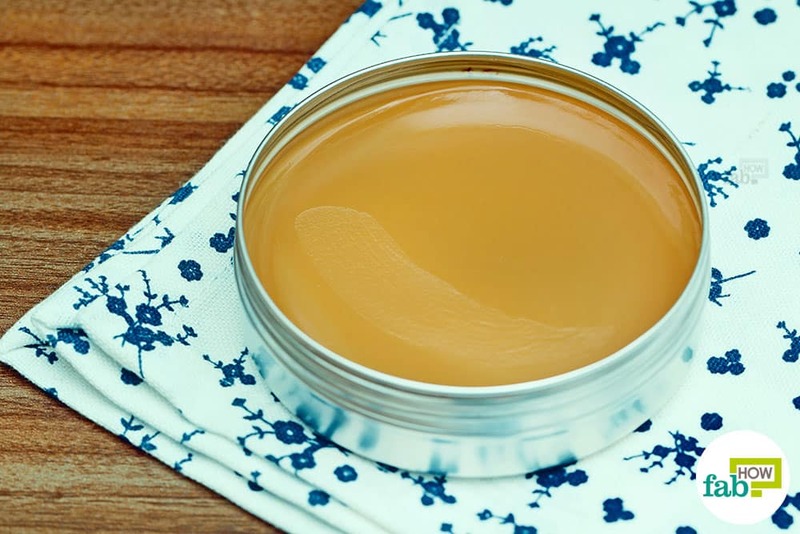 Arrange a double boiler by placing a heat-safe bowl inside a pan with a little water in it. 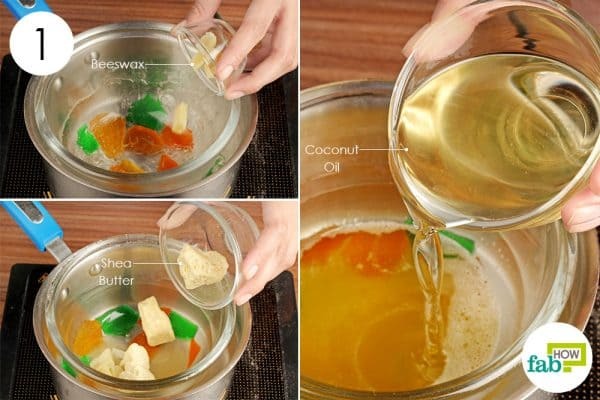 Allow the ingredients to melt and blend on low heat, then remove it from the heat. Add 1 teaspoon of non-nano zinc oxide powder, while whisking the mixture continuously to prevent the formation of clumps. 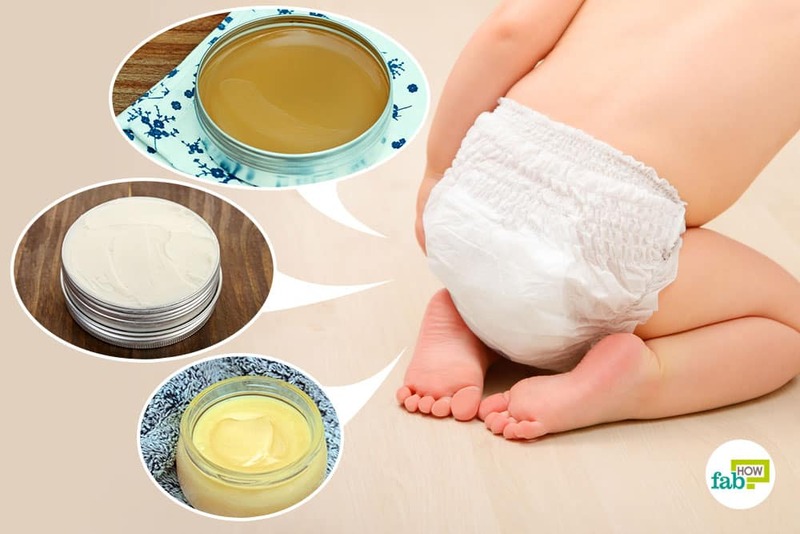 Use the prepared DIY homemade diaper rash cream on clean and air-dried skin each time you change your baby’s diaper to get rid of the diaper rash. Keep an eye on your baby's diaper and change it as soon as it becomes wet or soiled. Use plain water to clean your baby’s genital area. If needed, you can use a mild cleanser to get the poop off your baby's skin. Do not rub the skin while cleaning it. Always gently pat the diaper area clean and dry. Avoid using commercial baby wipes too often, especially those with fragrances or alcohol. 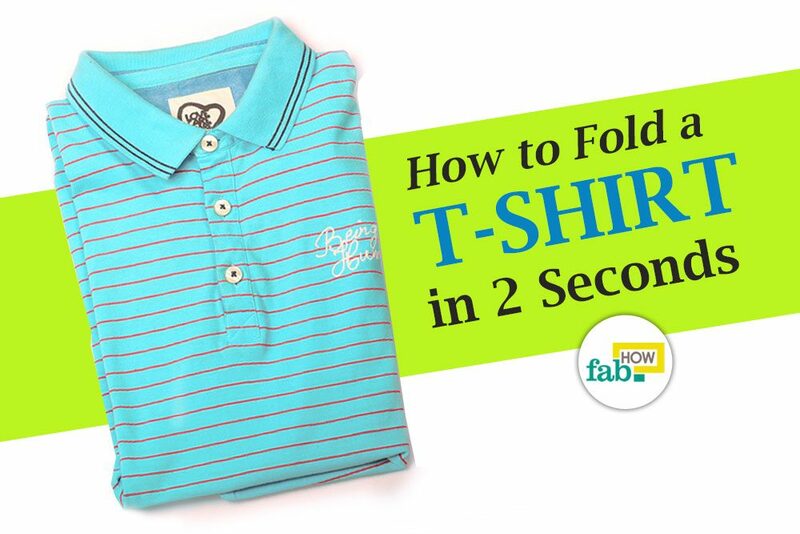 Instead, use a clean and soft washcloth and plain water. Make sure the area is completely clean and dry before putting on diaper rash cream and a fresh diaper. If your baby is suffering from a severe rash, try using a squirt bottle to wash the area well. This will avoid rubbing the sore skin. Let your baby go diaper-free as much as possible. Airing out the diaper zone helps a baby's skin heal faster. Reick S, Hubenthal N, Zimmermann M, Hering T. Lokale Barrierecremes zur Hautpflege bei Neugeborenen, Säuglingen und Kleinkindern mit Inkontinenz-assoziierter Dermatitis (IAD) – Eine narrative Literaturübersicht. Pflege. https://www.ncbi.nlm.nih.gov/pubmed/28071289. Published 2017. Lin T-K, Zhong L, Santiago JL. Anti-Inflammatory and Skin Barrier Repair Effects of Topical Application of Some Plant Oils. International journal of molecular sciences. https://www.ncbi.nlm.nih.gov/pmc/articles/PMC5796020/. Published December 27, 2017. Šikić Pogačar M, Maver U, Marčun Varda N, Mičetić-Turk D. Diagnosis and management of diaper dermatitis in infants with emphasis on skin microbiota in the diaper area. International journal of dermatology. https://www.ncbi.nlm.nih.gov/pubmed/28986935. Published March 2018.